Membership means full access to recROC training and fitness facilities, year-round! A variety of Membership plans makes joining recROC convenient and flexible. Guests are welcome as individuals or groups at recROC. Day Passes allow guests full access to the facility. NonMembers may also register for programs and special events at NonMember rates. Shoe and chalk rentals are optional. Please note that proper footwear is required while using the obstacle course and boulder – no bare feet! A variety of seasonal programs are available to Members and nonMembers. In some cases, a per-person fee will apply, but typically Members will benefit from discounted fees to participate in classes and programs. 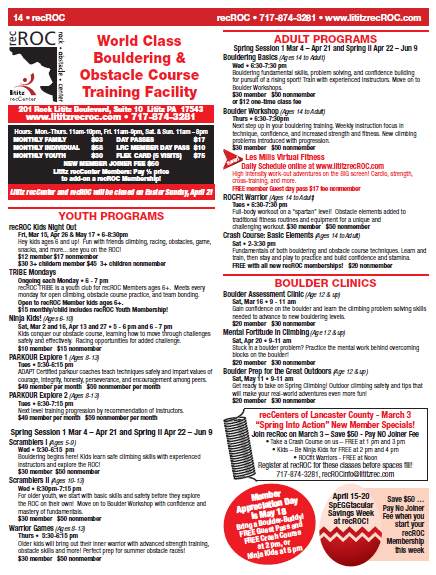 See our Current Program Guide for details.